The DaDaDocs Salesforce integration is a complete online editor for typing, editing, erasing, blacking out and annotating text as well as signing documents. Work with Word and PDF files in your Salesforce account, and share documents with your partners making them available to anyone on any mobile device. 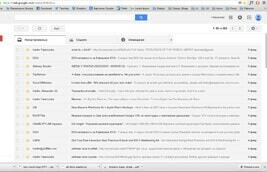 Have you ever needed to make notes on sales contract or invoice stored in your Salesforce account? With PDFfiller’s powerful editor you can not only edit your Word or PDF documents without leaving Salesforce account, but also make notes to hint and guide the recipients through a document’s content. Alternatively, notes are helpful in terms of your own revisions to a document. To get started, select the Salesforce object and click the drop-down menu near the required Word or PDF document on the right. Click on Edit. Sticky notes attached over the content of the document. To comment using a text box, select Text Box in the toolbar and click where you'd like to place the box in the document. To resize the text box, drag its corners or edges. To change the color of its border, click the color icon that says Box in the formatting toolbar and select the color that you want. To change the color of the box itself click Background and choose the color. To enter text into the box, click inside and start typing. To change the font type, click the box with the current font name in the formatting toolbar and choose from the dropdown menu. You can change the font size by clicking the number next to the font and selecting from the dropdown list. To underline your text, to make it bold or italic, use the U, B, and I icons. To change the text color, click the color box on the right of the font tools and select the color you want. To add comments in a sticky note, while in the editor, select Sticky. Click where you'd like to place the note. To resize the note, drag its corners or edges. To change its color, click the yellow icon that says Box and select the color you want. To enter your comment, click inside the note and start typing. You can format your text using the above-mentioned tools. In addition, you can always easily remove a sticky note or a text box from the document. To do this, just click it and then click the trash icon. 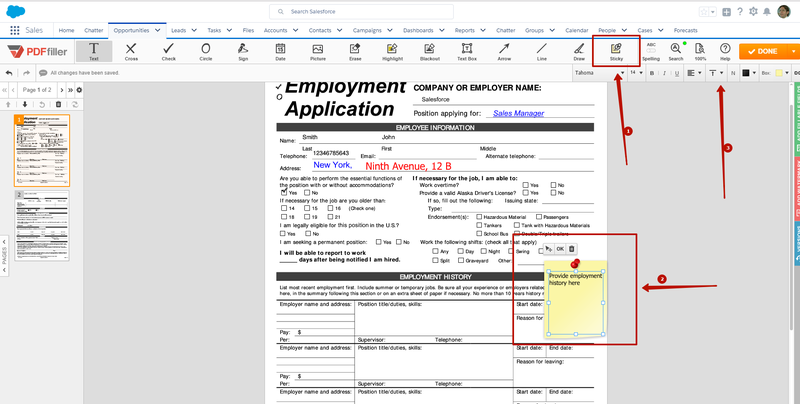 When you have finished editing, click the Done button in the top right corner and save your document back to your Salesforce account, send it out for signing or turn into interactive fillable form available to anyone to fill out from any device. 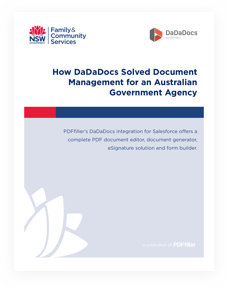 An Australian government agency uses DaDaDocs for Salesforce to securely redact, edit and sign PDF documents. 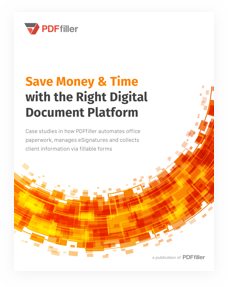 Businesses use PDFfiller to collect information, automate paperwork, edit PDF documents and get eSignatures. Thank you for your interest in the DaDaDocs integration. Get the most out of DaDaDocs by getting the integration customized specifically to your organization’s needs. Please complete the form so that one of our sales representatives can get in touch with you to discuss the right digital document solution for your organization. Thank you for your interest in PDFfiller. See how to get the most value out of PDFfiller’s powerful tools by downloading one of our guidebooks. Please complete the form so that one of our sales representatives can get in touch with you to discuss the right digital document solution for your organization.